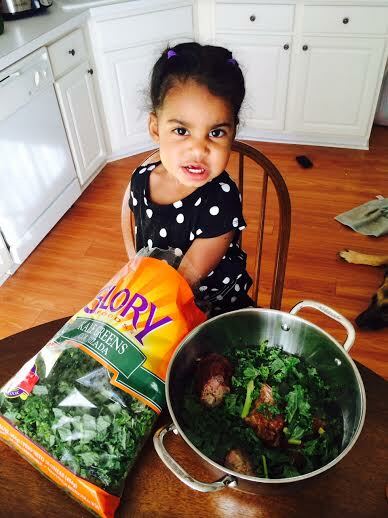 Even though my oldest daughter isn’t even two yet, she has a genuine love for cooking. She is my ultimate sous chef and helps me with breakfast each morning. As soon as she wakes up, she tells me, “Daddy, I cook!”. How could I ever tell her no? While my wife and youngest daughter are fast asleep, my daughter and I mix, chop and sauté our way to a nutritious meal each morning. Earlier this week, I had a bag of kale in the fridge and decided that it was time for her to learn about the food that is culturally significant in our family. If you don’t have any African American friends, you may not know much about the history of soul food. If you are African American, you still may not know much about the history of soul food. Soul food got its name in the mid 1960s, as part of the Civil Rights movement. The term of “soul food” took on a powerful meaning to many African Americans because it evoked a painful history of enslavement and prejudice but also celebrated the ingenuity, perseverance and pride during a difficult time in our history. Some people describe soul food as basic, down-home cooking that originated in the rural South and has been passed down through generations. Others define it as being directly derived from West African cooking, by way of the triangular slave trade that included Africa, the Caribbean and North America starting in the late 1400’s. During that time, African slaves began to cook with new kinds of greens (collards, mustard, and kale), turnips, beets, and even dandelions. The slaves were also given pig’s feet, beef tongue, ham hocks, chitterlings, and other unwanted meat products of the pig and cow. To flavor their recipes, they added salt, garlic, onions, and bay leaves. Early soul food recipes also included rabbit, raccoon, and any other small animals they caught on their own. Even though they were run out of the Southern US and transported to Oklahoma (via smallpox, murder, and the Trail of Tears), Native Americans greatly influenced what we now know as “soul food”. Hominy, sofkee (a version of grits), hush puppies, and cornbread are all ways Native American have made their indelible mark on southern and American cuisine. Place greens into pot of water. Add remaining ingredients. Cover and cook on low for 2 hours. Eat. Smile. Repeat. It’s cool to read about you cooking with your daughter. My mum encouraged me to get involved with cooking when I was small and I used to cook one meal a week from the age of about ten or eleven. It’s such a good skill to have and great to get involved with cooking at a young age.